Let us show you a wonderful time on a personal, entertaining, and educational tour of the swamp! 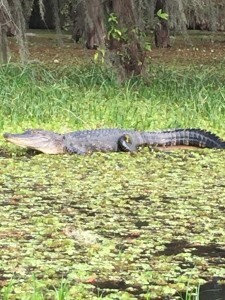 Come see alligators, a wide variety of birds, turtles, snakes and much more at Lake Martin, located in Breaux Bridge easily accessible from Lafayette, Baton Rouge, and New Orleans. Private tours for bird watching and photography are available and a wonderful way to see all the wildlife on your own private adventure! 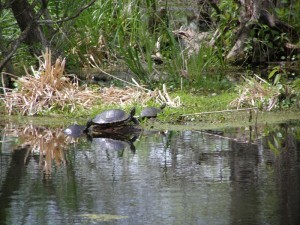 We offer a more private setting for a relaxing, entertaining swamp tour, with our 6-8 person boat. Open 7 days a week, from sunrise till sunset. Night time tours also available by appointment only. We are located in Breaux Bridge, minutes from Lafayette, and 30-45 minutes from Baton Rouge, and 2 hours from New Orleans. Day time tours approximately 2 hours $20.00 per adult. $10.00 per child under 10 years old. Night time tours approximately 2 hours $50.00 per person. Our tours times are 8am, 10,am, 12pm, 2pm, 4pm, and 6pm. Night time swamp tour generally start between 8:30-9pm. 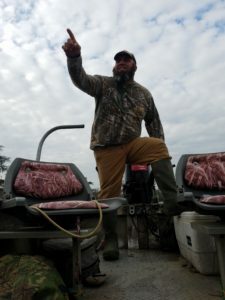 My name is Bryce Fuselier the operator and half owner with my wife Ashley of Swamp Tours of Acadiana. I was born in St. Landry Parish La. in August 1966. My parents raised me in Evangeline Parish La. till my early 20’s. I left home and moved to St. Martin Parish La. where I acquired property at Lake Martin La. and reside today with my wife Ashley, my son Samson, four dogs and a cat. My parents thought me the cajun culture way of life including hunting, fishing and crawfishing. All I know today about Louisiana swamps and its hidden secrets were passed down by my grandfather and dad. Their knowledge has helped me show people like you about the beautiful culture and hidden beauty of the swamps of Louisiana. I try every day to enjoy life and show my children the same thing that my parents instilled in me, like to be respectful to people, to be honest and truthful with your beliefs and also work hard to achieve my future goals. (TID BIT) I love being a husband and father. My passions are giving great tours, making hammered copper jewelry, and wood-working. 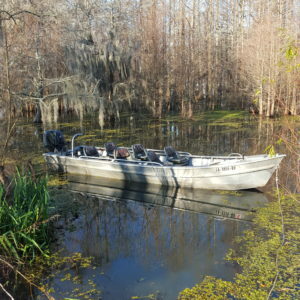 The swamp tour boats are the original cajun crawfish skiff still used today by local fishermen in Louisiana swamps and bayou. These boats allow us to access deep into the heart of our beautiful Lake Martin swamp where the bigger boats can’t access, perfect for photography. All the boats are inspected by Louisiana Wildlife Fisheries and Licensed. The boat guide is a native of south Louisiana and a residence of Lake Martin. He was born and raised in the Cajun culture. The boat can seats 6 people comfortably on padded seats also seats 2 extra people on a bench in front of boat. Once afloat you be able to enjoy the sights and sounds of the lake while being pushed alone by push-pole like our great ancestor did for many years.